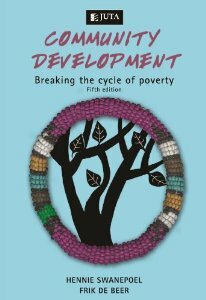 Authors: SWANEPOEL, H. & DE BEER, F.
In its fifth edition, this account continues to be the definitive guide for community development workers, students, and practitioners alike. It contextualizes poverty against the backdrop of the Millennium Development Goals and explains the process of community development-detailing, in particular, the skills required by a community development worker, especially communication. In this latest edition, more attention is paid to the development environment, concepts such as asset-based community development and the social enterprise sector are explained, and the principles of sustainability and compassion are underscored.